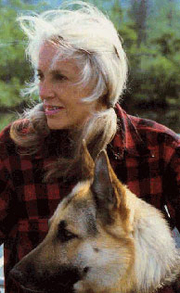 Anne LaBastille received her doctorate degree in Wildlife Ecology from Cornell University in 1969. She also held a master's degree in Wildlife Management from Colorado State University, and earned her bachelor's of science in Conservation from Cornell. She was a pioneering environmentalist whose work reached from the USA to Guatemala, and was the author of more than a dozen books. She also wrote more than 150 popular articles and 25 scientific papers. She was a contributing writer to the Sierra Club and National Geographic, as well as many other magazines. Anne LaBastille gave wilderness workshops and lectures for 40 years and served on many conservation organizations in her beloved Adirondack Mountains of New York. She traveled around the world and worked with many nonprofit organizations to study and reduce the destructive effects of pollution on lakes and wildlife. She also was a noted wildlife photographer whose work appeared in many nature publications. Anne Labastille is currently considered a "single author." If one or more works are by a distinct, homonymous authors, go ahead and split the author. Anne Labastille is composed of 5 names. You can examine and separate out names.